Who doesn’t love jalapeño poppers? Come on. Seriously. But who wants to fill jalapenos and bread each one individually? Not me. When my boyfriend and I have get-togethers with friends I love making homemade snacks. 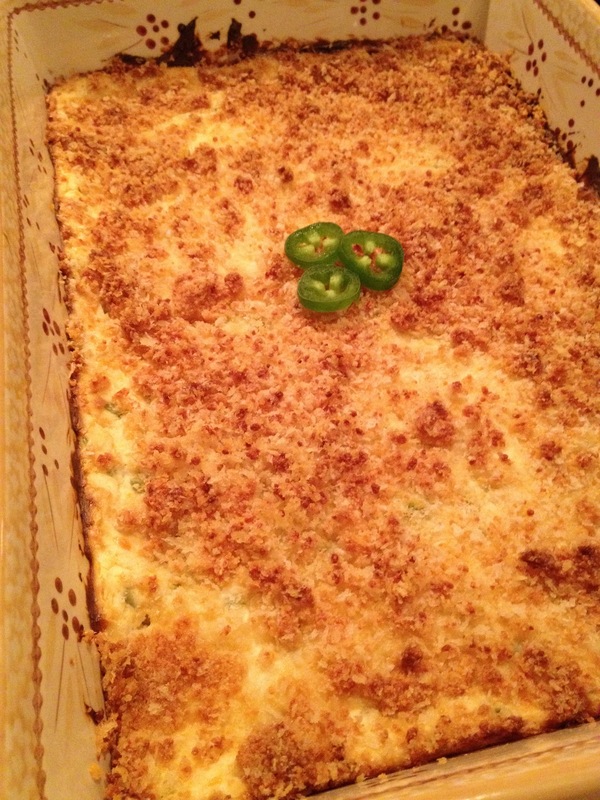 Jalapeño popper dip was my choice for the evening. It is best served warm. So, next time instead of baking it, I’m going to put the whole cheese mixture in my crock pot on warm, let it heat up, and then toast the breadcrumbs and Parmesan cheese in a teeny bit of olive oil or butter to toast them, and put on top. The repeated re-heating of the dip changed the texture a bit. I’ve found lots of recipes via foodgawker for such a dip, but I wasn’t crazy about loading it with mayonnaise, butter and things of the like. So I attempted to make it healthier. I swapped out the mayonnaise for Greek yogurt – if you haven’t noticed I’m a huge fan of this – left out some of the butter. I also used Neufchatel cheese, which is cream cheese with less fat. Needless to say, it was a huge hit! Serve with tortilla chips, pita chips, crackers, veggies, or whatever floats your boat. Combine the cream cheese, yogurt, jalapeño, garlic, cumin and cheddar cheese together in a bowl. Pour into a 9×13 baking dish. In a small bowl, mix together the melted butter, Parmesan cheese and Panko breadcrumbs. Sprinkle over top of your mixture in the baking dish. Bake in the oven for 20-25 minutes or until the dip becomes bubbly and brown. Let stand 5 minutes before serving. Eat up! Note: If you are going to have people lingering and eating the dip over a couple of hours, put the dip in a crock pot and cook on low for about 45 minutes then turn your crock pot down to warm. To get the breadcrumbs toasted, heat the butter, parm cheese, and breadcrumbs in a frying pan until browned. Sprinkle on top before serving. I did not try this method out, but I’m sure it will work perfectly and I plan to do it next time I make the dip.